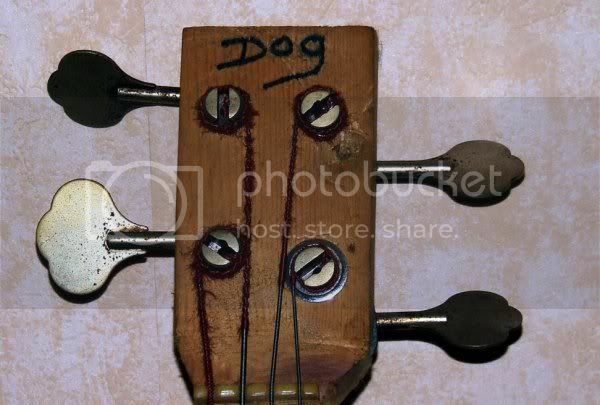 Absolutely unique - the Dog Bass! "...the bass I've had for over 27 years. One night I got drunk and pulled all the frets off, then drunk again a couple of weeks later I tried to stick them back on again. A while after that I got drunk yet again, and decided to whittle a new neck out of a piece of 3" x 2" timber I had in my shed. That said, it played, and I have used it on many of my recordings." Let this be a lesson to you, folks. 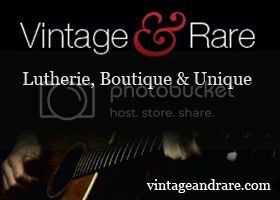 Don't drink and perform previously un-planned luthiery this Christmas! 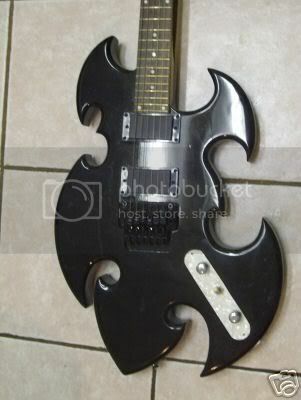 Ever Fallen In Love With A Guitar You Shouldn't Have? 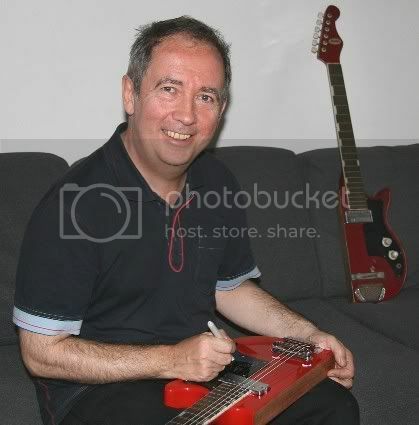 Eastwood Guitars - those kings of the retro-reissue guitar - proudly present the limited edition Pete Shelley Starway signature guitar, based on a guitar with a partially broken body that Pete played in the early days of classic punk band The Buzzcocks. 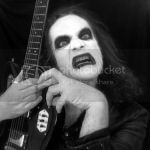 Judging by the headstock shape and those distinctive fingerboard inlays, my guess would be that the original was a Teisco - probably the E-100 model (look it up on the Teisco Twangers website). Apparently - and rather surprisingly, I thought - Gibson have had so many requests to make this former limited edition guitar of the week more widely available that they've produced an additional 900 instruments in their custom shop - 300 each in natural, ebony and white finishes. 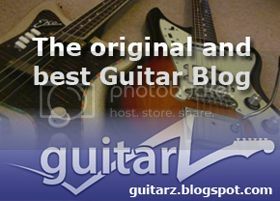 See the Gibson Reverse Flying V micro-site for more details. 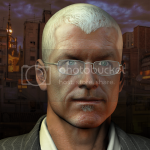 Comments will now be moderated. Sorry about that, folks, but there's always one brain-dead simpleton who has to spoil it for everyone else, in this case a retard calling himself Ed, who - no surprise - was too chicken to leave his email address. 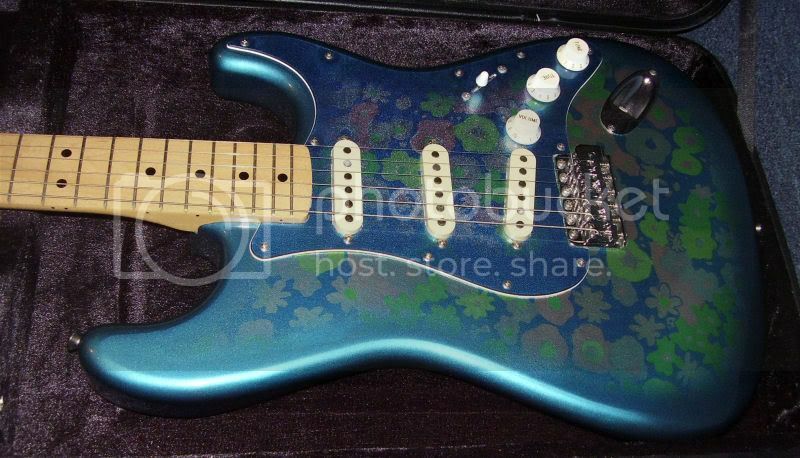 It's an original 1988/89 Made in Japan Blue Flower Fender Strat, not one of the inferior recent reissues (nasty scratchplate and small headstock on those), and what's more - it's absolutely pristine! There's not a scratch on her. One lady owner, low mileage, etc. 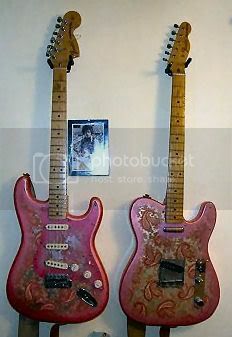 Long-term blog readers will know that I used to have a pair of Paisley Pink Fenders from this same period - a Telecaster and a Stratocaster (pictured here on the right) - and I had to sell them as I needed the money quite urgently at the time. I've always regretted that sale, but this Blue Flower baby makes up for some of that. Wow! What a find! 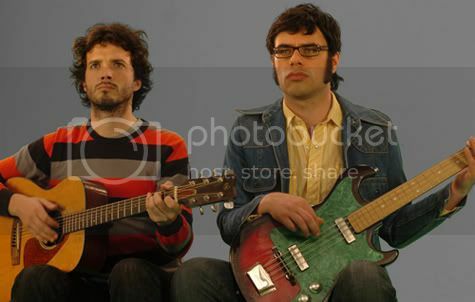 Sadly, tonight in the UK on BBC4 we'll be seeing the final episode in the first series of Flight Of The Conchords - one of the funniest and most inventive comedy shows to be seen in recent years. The premise is simple: Bret and Jemaine are two naïve musicians from New Zealand trying to make it in the music business in New York, aided and abetted by Murray their usually inept manager who has a day job in the New Zealand Consulate. 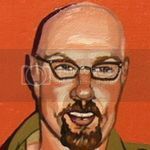 If truth be told, not a lot actually happens of any momentum to our two heroes throughout the series. The joy of this programme is in the ridiculous dialogue, the hopeless tangles they get themselves into, and the fantastic and often quite surreal songs that are woven into the scripts usually in the form of some dream sequence. Led Zeppelin: The guitars are as much a part of their image as Robert Plant's blond cascade: Jimmy Page's guitars are as much a part of the Zep image as Robert Plant's blond cascade. Article from The Independent. 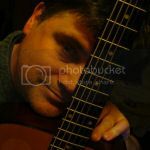 This guitar really takes the biscuit! 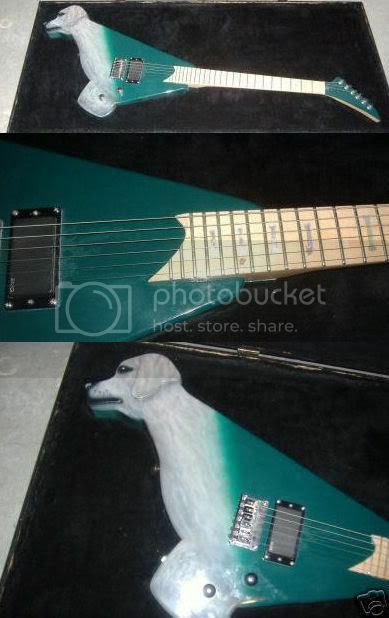 It looks as if someone wanted to emulate the now legendary Dobbincaster and create an animal-themed guitar. 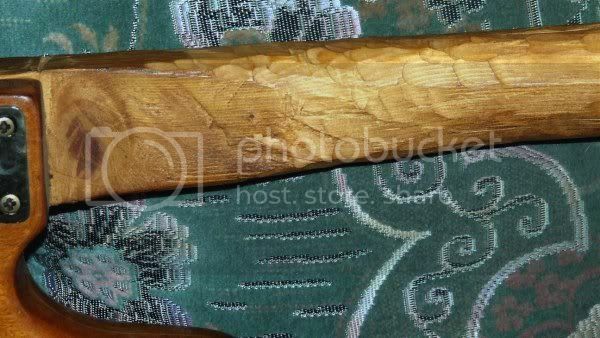 Check out those fingerboard inlays - they are bone shaped. Wacky, eh? I reckon they could have been a bit more inventive. For instance, how about having the dog's head emerging from a kennel? As it is, the fade to a turquoise Randy Rhodes style shape just doesn't work for me. And why not give the dog a collar and attach the strap to that as if it were a leash? That would have been quite funny. "Great sound for heavy metal", it says. Now, had Anthrax changed their name to Basketful of Puppies as was once suggested during the anthrax scares of a few years ago, then this would have been the guitar for them. 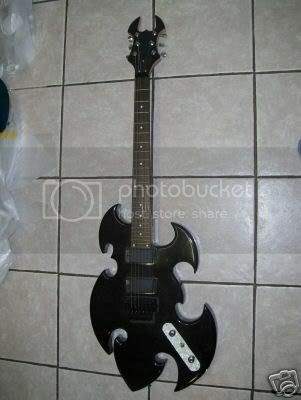 One of these days I'm going to start up a spoof gothic band and get in a bunch of hideous guitars a bit like this. 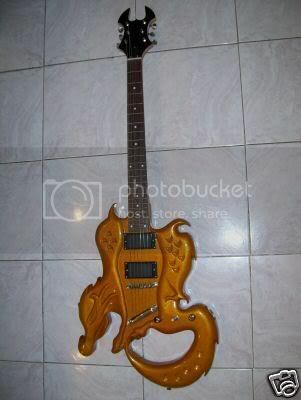 This guitar found for sale on eBay (where else?) looks like it could be a cousin of the squashed frog. 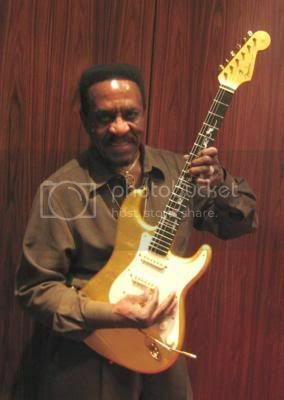 US soul musician Ike Turner dies R.I.P.